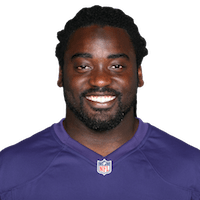 Published: Nov. 18, 2018 at 01:27 p.m.
Baltimore Ravens running back Alex Collins bounces outside for Ravens' opening-drive touchdown. Published: Nov. 4, 2018 at 03:18 p.m.
Baltimore Ravens running back Alex Collins bounces it to the outside for 1-yard touchdown. Published: Oct. 28, 2018 at 04:35 p.m.
Baltimore Ravens running back Alex Collins rushes for a 14-yard touchdown. Published: Oct. 14, 2018 at 06:26 p.m.
Baltimore Ravens running back Alex Collins goes untouched for 2 yards for his second touchdown of the game.